If you were a part of the initial wave of newly minted commercial drone pilots when the FAA first released the new Part 107 exam (officially called the “Unmanned Aircraft – General” exam) in August 2016, you might know that it’s almost time for recertification! 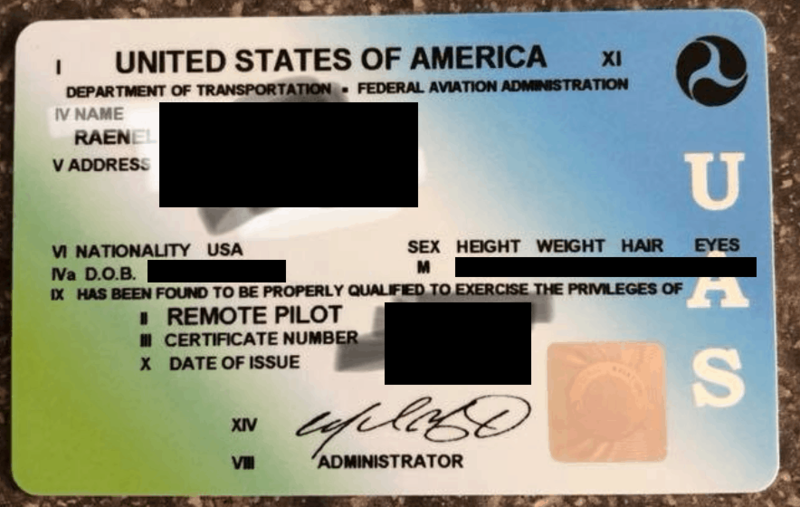 What Does Drone License Recertification Mean and Does It Apply to Me? First off, if you want to fly drones for commercial purposes or for any reason other than for recreation, you need to hold a Remote Pilot Certificate (commonly referred to as a Commercial Drone License or Part 107 License). You can obtain your Remote Pilot Certificate by taking and passing an FAA knowledge exam and undergoing a small background check. Find out more on the initial drone license certification process here. But, if you ALREADY have your Remote Pilot Certificate, one of the things you need to remember is that you are required to take the FAA recurrent knowledge test at least every 24 months in order for your license to remain valid. When Do I Need to Have Taken the FAA Recurrent Knowledge Test By? For instance, if you passed your initial exam on August 20, 2016, you would have to pass the recurrent knowledge exam NO LATER THAN August 31, 2018. To make it easy on you, we created a calculator to let you know the date by which you need to pass your recurrent knowledge exam. Just enter the date you passed your most recent initial or recurrent knowledge exam, and it will tell you when you need to pass your next recurrent exam by. What Does the Drone License Recertification Process Entail? So, what do you need to do to tackle the recertification process? Keep reading to see what is covered on the exam and how to sign up. What Does the Recurrent Knowledge Exam Cover? Good news. 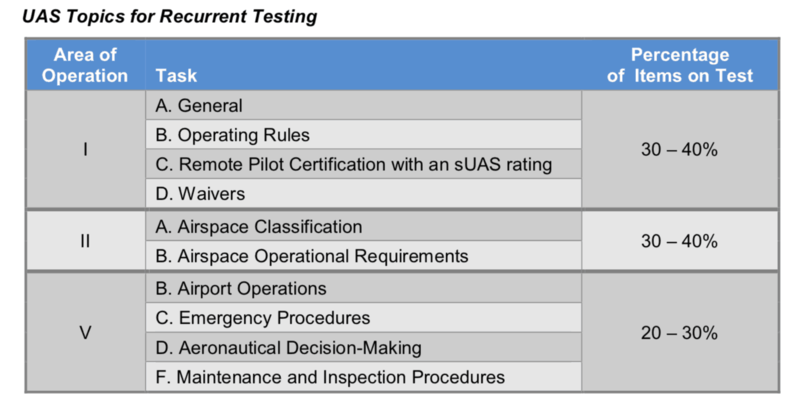 The recurrent knowledge exam only tests remote pilots on a limited portion of what was covered on the initial, Unmanned Aircraft – General knowledge exam (the initial Part 107 exam). So make sure you are familiar with questions related to sectional charts and airport operations! We’ve trained several thousand students for the initial knowledge exam through our Part 107 Exam Prep Course, and this is the area that seems to trip people up the most. The FAA recurrent knowledge exam is given at FAA-contracted testing centers around the US, just like the initial knowledge exam. CATS/PSI is the company that provides the testing and scheduling for the FAA. We spoke with them the other day, and they said that they started offering the recurrent knowledge exam on June 11, 2018, so you can schedule your test today if you want! To schedule your exam, you can call CATS/PSI toll free at 1-844-704-1487. The people over at CATS/PSI are very nice and can help you find a testing center that is close by and is open during a time that works for your schedule. If you want to take a look online at what testing centers are near you, click here. The exam costs $150 per attempt (same as the initial knowledge exam). This fee is paid to CATS/PSI (not the FAA). If want to make sure you are studied up and ready to pass your knowledge exam, Drone Launch Academy provides two resources. Part 107 Digital Flash Cards ($39) – these digital flashcards are a quick way to go over the key points you need to remember for the exam. The best way to commit something to memory is repetition! These flashcards enable you to drill home the info you need to know.